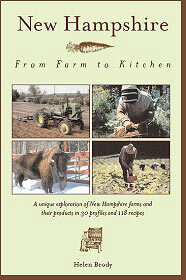 different from other New England cookbooks. such diverse farms right here in our own little corner of the world! as soups, stir fry veggies, or whatever the catch of the day is on the table. from. It is truly amazing how much one can really do this in NH! very surprised to hear that it really was only a few times! hard sauce to go along with the pudding. I’ll have to ask Mom for that one! I asked Helen if she thought she would write a similar book about Vermont. for the rest of the year and then she would decide. So, keep a look out!